Lentil Salad – Happy New Year! Many cultures welcome the New Year with some sort of legumes and greens. Perhaps because the legumes resemble coins, or the fact that when you add water to them they swell, so you get more than what you started with. In the South they often have black eyed peas and greens. The greens may symbolize good luck. In Hungary it's lentils, which is the tradition I will be enjoying this year. However, I did not enjoy my lentils at midnight which promises lots of money in the New Year according to my friend Eszter. This hot salad will be a welcome dish in my home year round, and pretty enough to serve to deserving company. The combination of lentils, vegetables, and sausage makes this a wonderful stick-to-your-ribs winter day treat. However you choose to bring in the New Year, I wish you all a wonderful, and prosperous 2009, and a heaping helping of lentil salad! Cheers! In a large stock pot add lentils, chicken broth, water, tomatoes, carrot, celery, onion, Italian seasoning, garlic, and sausage. Bring all to a boil over medium-high heat, covering pot but leave a gap for steam to escape. Once boiling, reduce to medium-low and continue to cook until lentils are tender, about 1 hour 50 minutes. 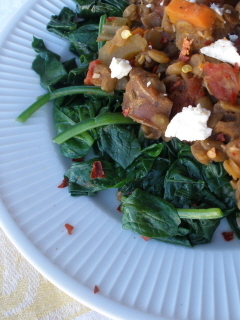 With about 10 minutes left on your timer for the lentils, begin to sauté the spinach. In a medium sized skillet, heat EVOO over medium heat. Once hot, add chili sauce and spinach and sauté until wilted. 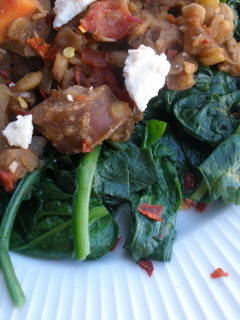 Transfer equal portions of spinach to plates and top with lentils and a bit of feta.